United Teachers Los Angeles is a nonprofit organization with staff from the Los Angeles Unified School District. 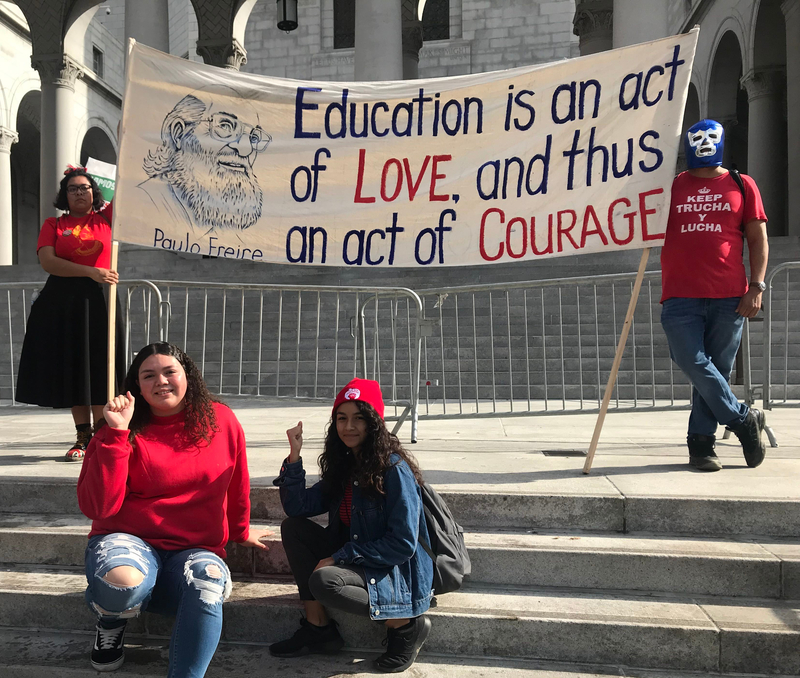 The strike was created because the teachers and staff of UTLA demanded a salary increase, proper funding for more counselors, nurses, and librarians. They also demanded a stop to standardized testing, regulations on charter-school growth, and more smaller class sizes, as most of the teachers have classes filled with 40-50 students. The UTLA Strike began on Jan. 14 and ended after a week on Jan. 22. The first time I heard about the strike happening was when I was in school overhearing my classmates talking. We have just gotten back from winter break and we were honestly confused why the teachers were going on strike. I began asking my teachers for more information on the strike and why it was happening. After hearing the reasons they were going to strike, I knew I wanted to help and support them. I wanted to show my peers why the teachers were going on strike, so with the ASB Leadership in my school we created posters to hang around campus, stating the things UTLA demanded. Unfortunately shortly after, one of the staff administrators in my school brought the posters down and told us we were not allowed to visually display anything regarding UTLA during class hours, that the district did not allow it, and if it was seen by any of the district representative the teachers were going to be the ones to blame, even if it was made by the students. I printed out my speech, ready to announce, but showed it to the same administrator that brought the posters down, in case I got in trouble for saying anything I was not supposed to. I wanted to play it safe after hearing a senior at another school got fired from her position for saying “Teachers, We support you.” He went over it with the principle and together they “edited” my speech to what I was only allow to say. Overall I was still not allowed to announce anything regarding the UTLA strike, I’m glad I was able to announce at least something, but I was still unhappy of the restriction my speech had. I wanted my message to be shared the way I wrote it, so I did it again but shared it instead on my social media accounts. I knew the majority of the teachers and staff were going to be on strike but I wanted my classmates to participate as well. The way I saw the strike personally was, if my teachers and staff are fighting for the students, why are the students are not striking with them? I was honestly disappointed with how easily my classmates were willing to stay home when the staff that would be on strike will be losing money to fight for better options for the students. I did my best to encourage others on my social media accounts to join the strike by posting the reasons UTLA were on strike, how it would affect the students, and key information on the marches. I explained to them if they chose to not join the strike, they can at least refrain from attending school, as LAUSD receives money for every student that attends school. I shared how if they went to school they were going to be put in one area, most likely the auditorium, and will stay there the whole school day, being watched by campus security unless they walked out of school. Staff and teachers on the picket line in front of Manual Arts Senior High School on the first day of the strike. UTLA Members on the steps of City Hall chanting in the rain. On the first day of the strike at my school campus, I couldn’t help but notice only three students ended up joining including myself. If you could only see the smiles and hear the constant thank-you’s the teachers gave us when they saw us arrive with our posters ready to picket with them. I was even able to meet my 5th grade teacher Mr. Williams, on the first day of the strike. The weather that week helped us, as students stayed home due to the rain but made it harder for us to picket and head to City Hall. Rain or shine, I continued protesting with my teachers and staff despite not knowing if my attendance would be counted, which would have affected me from walking the stage at graduation, as my school has an attendance policy where students cannot miss more than seven school days. Marching in the rain itself was an unpleasant experience but throughout the strike I got closer with the staff from my school and got to know them better. As the strike continued throughout the week, more students messaged me regarding if I was still on strike with the staff, as they wanted to help support them as well. As the strike continued, more and more students began to join us. The most unforgettable experience I had, was during the UTLA Rally at Grand Park on Jan. 18, being surrounded with members from my school and thousands of other teachers, nurses, librarians, counselors, therapists, parents, students, and other community members was such an amazing moment. That day the UTLA Rally showed me what solidarity and unity looks like. I was also lucky enough to take pictures with Aloe Blacc and Tom Morello before their performance. By Tuesday morning, on Jan. 22, the end of the strike was announced online, on the news, and on UTLA social media accounts. Stating the UTLA Strike was over after they have come together with the tentative agreement with LAUSD and now they must vote to proceed action. The cheers and cries of happiness were being heard later that day at the rally, that was being held in City Hall, when UTLA President Alex Caputo-Pearl spoke. I strike with my teachers because they strike for me. I knew they were not going to be paid that month, I saw how tired they were outside the school, in the heavy rain, on the picket line every morning, every day when they had to walk to fast-food restaurants to use the restroom, seeing them worry how and where they were going to eat. The teachers and staff still continued to worry and take care the students that strike with them outside of the campus even though they were not asked to. I lost track of how many times they asked me if I was OK because of the rain, if I was hungry or tired, they reminded me to take a break even though they were the ones that deserved to take a break. They continued to welcome me back every day I arrived to join them, and thank me every time they saw me, they continued to tell me how happy and grateful it was to see students join them. Witnessing the hard work everyone has done, continue to encourage and remind me why I had to strike with them. To show them even if it’s one student out there with them, we care for them, we love and appreciate them for all the things they have done for us. I want to say thank you so much to my schools nurse, librarian, counselors, teachers, and everyone that was out there everyday, outside on that picket line, because you taught and showed me, what we can do when we come together to fight for what’s right. What unity and solidarity can bring to our community. Thank you to every staff and community member that supported and participated during the UTLA strike.